All teachers and administrators must know how to educate English language learners! 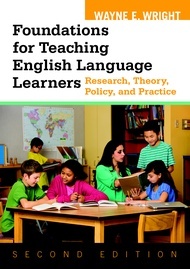 Foundations for Teaching English Language Learners: Research, Theory, Policy, and Practice by Wayne E. Wright is a comprehensive course text on ELL education for students in elementary and secondary teacher education, reading/literacy, special education, TESOL, bilingual education, and educational leadership programs. This text prepares educators to meet state competency requirements in ELL education. More importantly, this text prepares educators to provide equity and excellence to linguistically and culturally diverse students all day every day. Foundations includes an interactive companion website with extensive resources for students and professors. Professors appreciate the Professor Control Panel on the site, which includes slide presentations that Dr. Wright has made to accompany each chapter, a sample course syllabus, and much more.